SEATTLE (AP) — The federal government is violating the Endangered Species Act by failing to consider how salmon fishing off the West Coast is affecting endangered killer whales, two conservation groups said Tuesday as they threatened a lawsuit. The Arizona-based Center for Biological Diversity and the Washington state-based Wild Fish Conservancy notified President Donald Trump's administration they intend to file a lawsuit within 60 days unless officials reevaluate whether the fishing further jeopardizes orcas that frequent the inland waters of the Pacific Northwest. "We can't allow business as usual in the salmon fisheries while Southern Resident killer whales are starving to death," Julie Teel Simmonds, an attorney with the Center for Biological Diversity, said in a news release. The orcas' plight has received much attention this year as scientists warn that they're on the brink of extinction. There are just 74 left, the lowest number since more than 50 were captured for aquarium display in the 1970s, and no calf born in the last three years has survived. One mother whale captured attention around the world this summer when she carried her dead calf on her head for 17 days in an apparent attempt to revive it. Last week, Washington Gov. Jay Inslee announced what he called a "herculean" $1.1 billion plan to help the population recover. The Democrat said the money would go toward protecting and restoring habitat for salmon, especially chinook, the orcas' favored prey; boosting production from salmon hatcheries; storm-water cleanup; and quieting vessel traffic, which can interfere with the whales' hunting and communication. But conservationists say more must be done. While a federal judge has ordered the government to consider boosting salmon runs by breaching four dams on the Lower Snake River, that prospect remains highly controversial and Republicans in Congress have vowed to oppose it. Unlike other populations of orcas, which feed on marine mammals including seals, the southern residents eat salmon — primarily chinook. The conservation groups said Tuesday that one way to help them immediately would be to catch fewer salmon off the coast, where the whales spend their winters. For now, the groups are not targeting fishing in Washington state's inland waters, including Puget Sound, where fishing quotas are managed under a different process. According to a letter the groups sent to the U.S. Commerce Department and the National Marine Fisheries Service, the federal government has been relying on an outdated 2009 review to authorize salmon fisheries up and down the West Coast. At the time of the 2009 review, there were 85 orcas in the southern resident population. Michael Milstein, a spokesman for the fisheries service, said it did not have any immediate comment. The letter noted that more than 200,000 chinook were caught by recreational and commercial boats off the coasts of Washington, Oregon and California last year, which researchers estimate as equaling as much as one-quarter of all chinook available. "There is now significant new information not only about the alarming population decline of the Southern Resident killer whales, but also about the relationship between Chinook and the orcas' reproductive success and viability," the letter said. 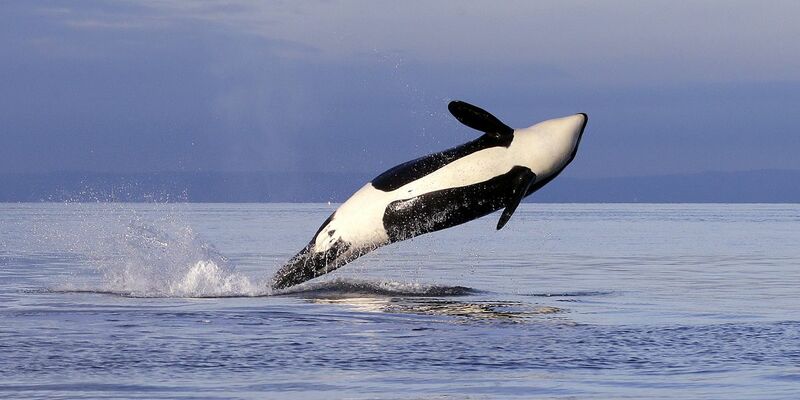 The Center for Biological Diversity sued to get the southern resident orcas listed as endangered in 2005 and filed two other recent lawsuits against the government — one to expand habitat protections to the orcas' foraging and migration areas off the West Coast, and another to establish a "whale protection zone" to shield orcas from boat noise and disturbance Puget Sound.